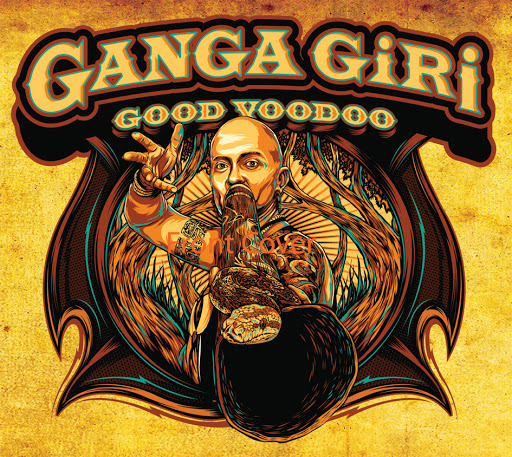 Song of the day: Ganga Giri – "Good Voodoo"
The estimable Will (Hi, Will! ), a PR chappy who bravely tries to promote a band with the remarkably unhelpful name Only The Sea Slugs, recently sent me some tracks by another artist he’s looking after. This artist is Ganga Giri, and he’s someone I’d never heard of before. I’ve now listened to the tracks Will sent me, and I’m beginning to suspect that he sent them to me on a dare. If sending me the music of Ganga Giri was the result of a dare, then I’m thinking that either Will was daring me to listen to music that’s way out of my comfort zone (cf. Runhild Gammelsæter), or someone dared Will to send it to me. Whichever is the case, and given that I’m primarily a power pop fan, I think someone somewhere is having a little chuckle. Before I had a listen, I looked at the visual stuff (promotional photos, album artwork etc) Will also sent me to get an idea of what kind of artist Ganga Giri is. I reckon you can usually get a ‘heads up’ on what you’re about to hear by what you see. You see someone wearing a skinny tie, for example, and you can make a fairly safe bet on what you’re going to listen to. Or if you see a male sporting buttock-length hair and wearing a black T-shirt with words in Gothic lettering on it, you’ve got a pretty good idea of what you’re going to hear. When I saw the promotional pictures of Ganga Giri I thought “Oh-oh.” Unfortunately for me, it looked like Ganga Giri was going to turn out to be the kind of individual who might walk around barefoot and barechested through forests and on beaches, at one with the Cosmos – someone who might be described as, say, an Earth Brother, or a Mountain Child, or even a Universal Harmonic Vibration Peace Harmony Man Of Nature. Judging by appearances (note to self: don’t judge by appearances, Peter) it seemed that, for Ganga Giri, vocal harmonies and distorted electric guitars were not high on his agenda. (“Electric guitars were not high”. He he.) Or, putting it another way: not power pop. From what I saw, I thought I was going to be inundated with a lot of acoustic guitars, slightly reggae-fied rhythms, a lot of singing about Mother Earth, and liberal dollops of peace, unity, and love. Anyway, where was I? Oh yeah. Getting sidetracked trying to anticipate what I was about to listen to solely by the visual aspect of the artist. Ultimately, that’s not particular helpful – or fair on the artist – because appearances can be… well, you know what they can be. Having listened to each of Ganga Giri’s tracks the requisite three times1, I’ve come to the conclusion that it just isn’t my scene. Now comes the tricky part. I’ll be the first to admit that I’m not very good at describing music I’m not at all familiar with, but I’ll give it a go. First of all, I can say that the music is not what I thought it was going to be (i.e., acoustic guitars and light reggae rhythms). I’d call it techno-didgeridoo music. In other2 words, it’s doof-doof music with didgeridoo accompaniment. As I was listening to all that doof I was struck – not by a didgeridoo – but by how relentless the tracks were. It’s one of my chief complaints about doof-doof music: the ‘doof’ takes precedence over everything else. Sure, there are things going on in the track (the occasional vocal, guitar, synthesizer, exotic musical instrument etc), but it’s so unvaryingly steady in its beat (i.e., doof, doof, doof, doof repeated ad infinitum) that my stamina evaporates. I can take a bit of an insistent night-club beat, but when it keeps going for four or five minutes I sit in front of the speakers and quietly wonder when the track is going to finish. Now that you’ve possibly read all of the above – and I understand completely if you didn’t, because there was a lot of waffling in those paragraphs – I’ll present you with what I think are three representative tracks from Ganga Giri. I’ll also leave it up to you decide whether you want to listen to them or not. Who knows – this music may very well be your scene. All of these tracks appear on Ganga Giri’s latest album Good Voodoo which you can hear in its entirety at Bandcamp. You are currently browsing the archives for the Ganga Giri category.